Dr. Christopher Emdin speaking about Science, Technology, Engineering, Mathematics (STEM), and Hip-Hop fusion in the community rooms, Thursday, Oct. 20. Many students showed up to listen to Dr. Emdin relate learning to Hip-Hop culture. 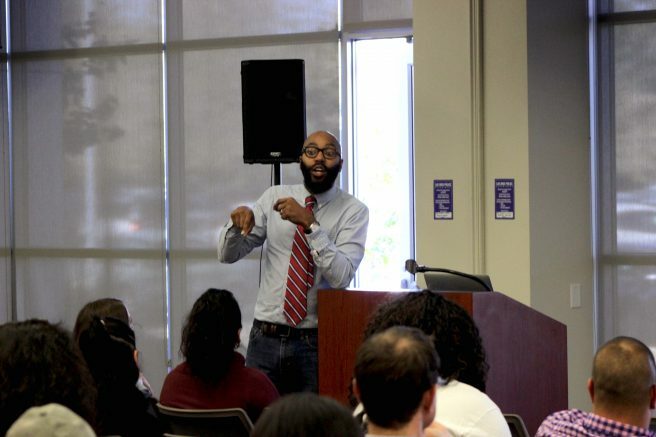 UNITE hosted Dr. Chris Emdin, bestselling author and public speaker who uses the art of hip-hop to keep students, especially students of color, engaged in science on Thursday. The community room at ARC was full, with Science, Technology, Engineering and Mathematics (STEM) students and aficionados and non-STEM folks alike. “I came because my sister read his book and (brought) me here” said Susan Fischer, ARC student. Fischer, studying for a degree in Education, said his words resonated with her. “It just blew me away because it wasn’t just about science, it was about justice, learning, everything. It was real,” Fischer said. Emdin’s talk was an engaging mix of hip-hop, science lecture and impassioned call to arms to help our youth bridge the chasm in the sciences. “Hip-hop is universal, it speaks to disenfranchised, disconnected youth around the world, it’s therapy,” Enmin said. Edmin addressed the growing disparity between children of color and their quality access to education and careers in STEM. “If a STEM (student) has no root, there’s no fruit,” Emdin said repeatedly throughout his talk. That chasm is abysmally wide. According to a 2006 report by the National Science Foundation, black men and women made up only 2 percent of employed scientists respectively. Hispanic men and women fared equally, and Asians only fared only slightly better with Asian men at 12 percent and Asian women at 5 percent. In an age when the economy is becoming more and more dependent on technology as a driving force in the actual delivery of those goods and services that move our economy, the concern is that students of color will be left on the bottom of the totem pole when it comes to having access to the higher STEM jobs. “There’s a disconnect between what scientists need and what is being taught in the classrooms,” Emdin said. He is a strong advocate for overhauling our education system to force us to examine our own stereotypes both conscious and unconscious and how they impact learning. The use of hip-hop as a natural tool to engage youth in education was, an “intuitive” one for Emdin. “However, even the intuitive gets obscured when you are locked in a school system that inhibits you from seeing yourself.” said Emdin. The connection between hip-hop and learning got stronger as he got older as he deliberately employed hip-hop in his own routine. In graduate school, he wrote raps to help him remember information. Hip-hop was always the backdrop during those long, late night study sessions. It was a lesson he carried into his own teaching. “I realized that I could deliberately make these connections for young people and it would help them academically,” Emdin said. Be the first to comment on "Author uses hip-hop to engage learning"